To access Land of Lincoln Credit Union’s Online Banking Services, simply enter your USER ID in the box on our homepage. If you are not yet enrolled in our Online Banking Services, please contact a Member Service Representative to help you get set-up. LLCU Mobile Deposit is a tool designed to make it easy and convenient to deposit checks into your accounts anytime, anywhere, by simply using your camera on your smartphone or iPad. This feature is automatically available when you have downloaded the LLCU Mobile Banking app (see instructions above). *New members must wait 60 days from their account opening before they are able to use Mobile Deposit. Checks payable to any person other than you.Checks payable to you jointly with one or more other person other than you. Checks that have been previously negotiated (including checks that may have been returned),remotely created, Sight Drafts, or checks more than 6 months old. *For Basic Checking Accounts in good standing, that have been opened at least 60 days,  with a valid email address on file, a daily limit of $1,000.00 is in effect. For all other personal checking accounts (excluding HSA accounts) in good standing, that have been opened at least 60 days, with a valid email address on  file, a daily limit of $2,000.00 is in effect. Lincoln Line is LLCU’s automated phone banking system that places your accounts at your fingertips 24 hours a day. Lincoln Line is safe, free and easy to use. You can access your LLCU accounts at times that are most convenient for you. For more information or questions, contact a Member Service Representative. LLCU BillPay allows you to automate paying your bills. This is especially helpful to keep you from making late payments or forgetting to pay a bill entirely, which can have a negative impact on your credit score. In addition, it can help you save money on postage and checks, while helping you organize your outgoing bills each month. To cancel a Recurring Payment, select MANAGE MY BILLS tab, select CHOOSE THE PAYEE, then click DELETE AUTOMATIC PAYMENT 1 and choose OK to confirm the cancellation. Deposits arrive faster and are made available more quickly than paper checks. Direct Deposits can be divided among different accounts based on your specific instructions. No need to visit the branch in person for check deposits or cashing. To sign up for DIRECT DEPOSIT, check with your employer or visit one of the LLCU branches. Land of Lincoln Credit Union is a part of a co-op that allows our members to use nearly 30,000 ATMs throughout the country completely SURCHARGE-FREE! 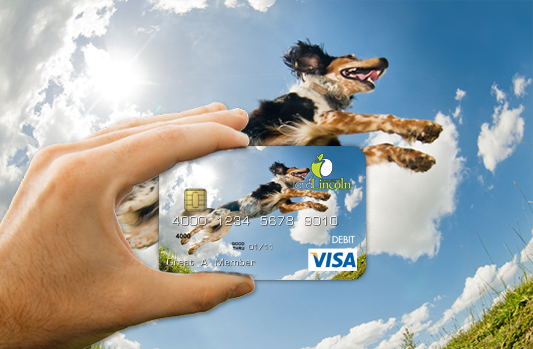 Customize your Visa® Debit card today with your favorite picture of a loved one! PopMoney at LLCU allows you to send and receive money quickly and easily! With PopMoney, you are able to send and receive funds from your account to anyone with an email or phone number. It’s just that easy and fast! A new window will appear and there will be a PopMoney tab at top. Click it and follow the steps to start using the service. *PopMoney transactions will incur a minimal transaction fee with each use. In addition, to use PopMoney, you will need to be enrolled in LLCU Online Banking and BillPay. Contact a Member Service Representative today to get started! Life is better with reminders! If you like to know when a check has cleared or if your payroll has been deposited, sign up for our free e-lerts. Login to LLCU Online Banking, under “Access Accounts”, select “Email Notification”. Select “e-lerts Options”, then “Add e-Lert”. On the next screen, choose from the list of notification types. Complete the process by including amount and reminder notes. Be sure to specify if you want the e-lert to be connected to checking or savings. Finish by confirming e-lert on the last screen. *Note: You will be able to edit your e-lerts at any time by clicking “Modify”. Contact a Member Service Representative if you have any questions. LLCU offers Text Banking for those that don’t like to remember passwords or wait for automated telephone prompts. Just send us a text and we’ll get you the information you need fast! Start a new text message and send it to “59289”. HIST + Account Nickname – by sending this, you can see a recent transaction breakdown for a specific account. Not sure about your Account Nickname? Login to your Online Banking, go to “Access Accounts” tab, select “Mobiliti” and finally select “My Accounts” tab. You will see all of your accounts with Mobile Banking Nicknames to the right. You can edit them there as well. Make them easy, select “CHECKING” for your checking. Got questions? Contact a Member Service Representative and they can help you set it up! See all of your accounts in one place. Import your account information from other financial institutions and see all of your balances at once. All you need is your username and password from the other institution's websites. Track your cashflow. Add income and bills like your paycheck, rent or utilities and tag transactions so you can see where your money is going at a glance. Create a budget. Set monthly spending limits and receive alerts when you're about to go over. Set goals and track progress. Choose your goal, set a time frame and see what you need to do to get there. To access Your Financial Portfolio, login to LLCU's home banking application from our website and click on the tab titled Your Financial Portfolio to get started. Multi-Factor Authentication (MFA). Due to guidelines set for the by the Federal Financial Institutions Examination Council (FFIEC), all credit unions are required to implement a security feature which is called Multi-Factor Authentication (MFA). MFA is the process of using multiple methods of identifying information to verify the identity of our existing members. Security Questions. You will be prompted to establish a set of security questions, which will be used to verify your identity and are used in addition to your Online Banking PIN. This will initially take a few minutes to set up, but will give you added protection. If you cannot recall the answers to your security questions, please contact a Member Service Representative at one of our local branches, or via the toll-free number 1-844-222-7788, and we will reset the questions so that you can provide new answers. Security question answers are encrypted and not accessible to anyone, including LLCU employees. Security questions can be edited at any time by logging onto Online Banking. Did you know that you can receive special deals and discounts just for being a Land of Lincoln Credit Union member? That’s right, joining a credit union can definitely have its perks. The tax laws have changed, but TurboTax is up to date on the latest tax laws and guarantees 100% accurate calculations, so you can be confident your taxes are done right and get your biggest possible refund. And, as a credit union member you can save up to $15 on TurboTax this tax season. Start today and save! You can buy discounted tickets online for Six Flags St. Louis and Holiday World & Splashin’ Safari. Just follow the links below, enter the provided username and password, and purchase your tickets. It's just that easy! *Discounted Tickets are limited to the Six Flags St. Louis theme park only. This agreement is subject to applicable federal laws and the laws of the state of Illinois (except to the extent that this agreement can and does bar such rules or laws). We may permit some variations from this standard agreement, but any variations must be agreed to in writing. Unless it would be inconsistent to do so, words and phrases used in this agreement should be construed so that the singular includes the plural and the plural includes the singular. As used in the agreement, the words “we”, “our” and “us” mean the Credit Union and words “you” and “your” mean the owner(s) of this account and any “agent” appointed by or on behalf of the owner(s) to sign on the account in a representative capacity. This account may not be transferred or assigned without our written consent. LIABILITY – Each of you agrees for yourself (and the person or entity you represent if you sign as a representative of another) to the terms of this account and the schedule of changes that we impose. You authorize us to deduct these charges as accrued directly from the account balance. You also agree to pay additional reasonable charges we may impose for services you request which are not covered by this agreement. Each of you also agrees to be jointly and individually liable for any account deficit resulting from charges or overdrafts, whether caused by you or another authorized to withdraw from this account, and our costs to collect the deficit including, to the extent permitted by law, our reasonable attorney’s fees. You agree that at our option we may suspend your membership rights if you violate the terms of this agreement. DEPOSITS – Any items, other than cash, accepted for deposit (including items drawn “on us”) will be given provisional credit only until collection is final (and actual credit for deposits of, or payable in, foreign currency will be at the exchange rate in effect on final collection in U.S. dollars). We are not responsible for transactions initiated by mail or outside depository until we actually record them. All transactions received after our “daily cut-off time” on a business day we are open, or received on a day in which we are not open for business, will be treated and recorded as if initiated on the next following business day that we are open. We are prohibited by law from guaranteeing the payment of dividends or that dividends we do pay will be at the contractual rate. We must base our dividend payments to you upon the money we actually earn and that is available for distribution at the end of the dividend period. Unless otherwise agreed, you waive any rights to receive any original item after it is paid. WITHDRAWALS – Unless otherwise clearly indicated to the contrary, any one of you who signs in the space designated for signatures on the signature card, including any agents, may withdraw or transfer all or any part of the account balance at any time on forms approved by us. We may charge against your account a check, even though payment was made before the date of the check, unless you have given us written notice of the postdating. The fact that we may honor withdrawal requests which overdraw the finally collected account balance does not obligate us to do so unless required by law. Withdrawals will first be made for collected funds, and we may, unless prohibited by law or our written policy, refuse any withdrawal request against uncollected funds even if our general practice is the contrary. We reserve the right to refuse any withdrawal or transfer request which is attempted by any method not specifically permitted, which is for an amount less than any minimum withdrawal requirement, or which exceeds any frequency limitation. Even if we honor a nonconforming request, repeated abuse of the stated limitations (if any) may eventually force us to close this account. We will use the data a transaction is completed by us (as opposed to the day you initiate it) to apply the frequency limitation. We reserve the right to require you to notify us of your intention to withdraw shares or deposits from this account as explained in our by-laws. Withdrawals from a time deposit prior to maturity or prior to the expiration of any notice period may be restricted and may be subject to penalty. See your notice of penalties for early withdrawal. OWNERSHIP OF ACCOUNT AND BENEFICIARY DESIGNATION – The rules apply to this account depending on the form of ownership and beneficiary designation, if any, specified on the account records. This Credit Union is hereby authorized to recognize any of the signatures subscribed hereto in the payment of funds or the transaction of any business for this account. The right or authority of this Credit Union under this agreement shall not be changed or terminated by said owners, or any of them except by written notice to this Credit Union shall not effect transactions therefore made. We reserve the right to refuse some forms of ownership on any or all of our accounts. Individual Account – is owned by one person. Joint Account – With Survivorship (And Not As Tenants In Common) – is owned by two or more persons. Each of you intend that upon death the balance in the account will belong to the survivor(s). If two or more of you survive, you will own the balance in the account as joint tenants with survivorship and not as tenants in common. Joint Account – No Survivorship (As Tenants In Common) is owned by two or more persons, but none of you intend (merely by opening this account) to create any right of survivorship in any other person. We encourage you to agree and tell us in writing of the percentage of the deposit contributed by each of you. This information will not, however, affect the “number of signatures” necessary for withdrawal. Revocable Trust or Pay-On-Death Account – Pay-On-Death accounts may be created only if the account is owned by one person. Revocable Trust accounts may be created by accounts with one or more owners. If two or more of you create a Revocable Trust account, you own the account jointly with survivorship. Beneficiaries of either of these account types acquire the right to withdraw only if: (1) all persons creating the account die, and (2) the beneficiary is then living. If two or more beneficiaries are named and survive the death of the owner(s) of the account, such beneficiaries will own this account in equal shares without right of survivorship. The person(s) creating either a PayOn-Death or Revocable Trust account reserve the right of survivorship. The person(s) creating either a Pay-On-Death or Revocable Trust account reserve the rights to: (1) change beneficiaries, (2) change account types, and (3) withdraw all or part of the deposit at any time. Corporate, Partnership, and other Organizational Accounts – We will usually require a separate authorization for designating the person permitted to withdraw and the condition required for withdrawal from any account in the name of a legal entity such as partnership, corporation, or other organization. We will honor the authorization according to its terms until it is amended or terminated in writing by the governing body of the organization. PLEDGES – Unless you tell us differently in writing, each owner of this account may pledge all or any part of the funds in it for any purpose to which we agree. Any pledge of this account must first be satisfied before the rights of any joint account survivor, pay-on-death beneficiary, or trust account beneficiary becomes effective. STOP PAYMENTS – A stop-payment order must be given in the manner required by law, must be received in time to give us a reasonable opportunity to act on it, and must precisely identify the number, date and amount of the item, and the payee. Our stop-payment cut-off time is one hour after the opening of the next banking day after the banking day on which we receive the item. Additional limitations on our obligation to stop-payment are provided by law. We will honor a stop-payment request by the person who signed the particular items, and, by any other person, even though such other person did not sign the item, if such other person has an equal or greater right to withdraw from this account than the person who signed the item in question. A release of the stop-payment request may be made only by the person who initiated the stop-payment. AMENDMENTS AND TERMINATION – We may change our by-laws and any term of this agreement. Rules governing changes in dividend rates have been provided separately. For other changes we will give you reasonable notice in writing or by any other method permitted by law. We reserve the right to close this account if your membership in this Credit Union terminates. You agree to keep us informed about your current address at all times. Notice from us to any one of you is notice to all of you. STATEMENTS – You must examine your statement of account with “reasonable promptness.” If you discover (or reasonably should have discovered) any unauthorized payments or alterations, you must promptly notify us of the relevant facts. If you fail to do either of these duties, you will have to either share the loss with us, or bear the loss entirely yourself (depending on whether we exercised ordinary care and, if not, whether we substantially contributed to the loss). The loss could be not only with respect to items on the statement but other items forged or altered by the same wrongdoer. You agree that the time you have to examine your statement and report to us will depend on the circumstance, but that such time will not, in any circumstance, exceed a total of 30 days from when the statement is first made available to you. You further agree that if you fail to report any unauthorized signatures, alterations, forgeries or any other errors in your account within 60 days of when we make the statement available, you cannot assert a claim against us on any items in that statement, and the loss will be entirely yours. This 60 day limitation is without regard to whether we exercised ordinary care. The limitation in the paragraph is in addition to that contained in the first paragraph of this section. DIRECT DEPOSITS – If in connection with a direct deposit plan, we deposit any amount in this account which should have been returned to the Federal Government for any reason, you authorize us to deduct the amount of our liability to the Federal Government from this account or from any other account you have with us, without prior notice and at any time, except as prohibited by law. We may also use any other legal remedy to recover the amount of our liability. TEMPORARY ACCOUNT AGREEMENT – If this option is selected, this is a temporary account agreement. Each person who signs in the space designated for signatures on this signature card (except as indicated to the contrary) may transact business on this account. However, we may at some time in the future restrict or prohibit further use of this account if you fail to comply with the requirements we have imposed within a reasonable time. FACSIMILE SIGNATURES – You authorize us, at any time, to charge you for all checks, drafts, or other orders, for the payment of money, that are drawn on us regardless of by whom or by what means the facsimile signature(s) may have been affixed so long as they resemble the facsimile signature specimen on the signature card or that are filed separately with us, and contain the required number of signatures for this purpose. RIGHT TO REPAYMENT OF INDEBTEDNESS – You each agree that we may (without prior notice and when permitted by law) charge against and deduct from this account any due and payable debt owed to us now or in the future, by any of you having the right of withdrawal to the extent of such person’s or legal entity’s right to withdraw. If the debt arises from a note, “any due and payable debt” includes the total amount of which we are entitled to demand payment under the terms of the note at the time we charge the account, including any balance the due date for which we properly accelerate under the note. Our right to repayment does not apply to this account if: (a) it is an Individual Retirement Account or other tax-deferred retirement account, or (b) the debt is created by a consumer credit transaction under a credit card plan, or (c) the debtor’s right of withdrawal arises only in a representative capacity. We will not be liable for the dishonor of any check or draft when the dishonor occurs because we charge and deduct an amount you owe us from your account. You agree to hold us harmless from any claim arising as a result of our exercise of our right to repayment. AGENTS - An agent is someone who you authorize to have access to this account on your behalf. (We, however, have no duty or agreement whatsoever to monitor or insure that the acts of the agents are for your benefit.) This may be done by allowing your agent to sign on the space as an authorized signer on the signature card, or by separate form (such as a power of attorney). An agent is not an owner of the account. We will allow agents to be appointed only on individual accounts unless each owner of a joint account has executed a separate power of attorney naming an agent.